Off heat, coat a grill or grill pan with cooking spray; preheat to medium-high. In a small bowl, combine barbecue sauce and hot pepper sauce. In a medium bowl, combine chicken, 1 tablespoon of barbecue sauce-mixture, scallion, celery, breadcrumbs, garlic and salt. Using wet hands (to prevent mixture from sticking), form chicken mixture into four 1/2-inch-thick patties; brush top of burgers with some remaining barbecue sauce-mixture. Place burgers on grill, sauce side-down; brush tops of burgers with remaining sauce. Grill, turning once, until cooked through, about 10 minutes. Lightly toast open-faced buns on grill during last minute of cooking. To serve, place 4 bun bottoms on each of 4 plates. 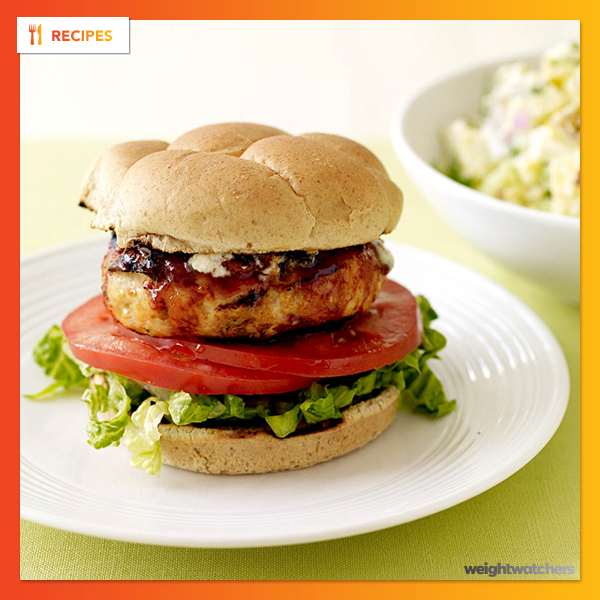 Top each with 1/2 cup of shredded lettuce, 2 tomato slices, a burger, 1/2 tablespoon of cheese and a bun top (cheese will melt a little from hot burger). Yields 1 burger per serving. If you like your food really spicy, give the lettuce and tomato a few shots of hot sauce.